I love when a simple technique can be used to make something look extra special. 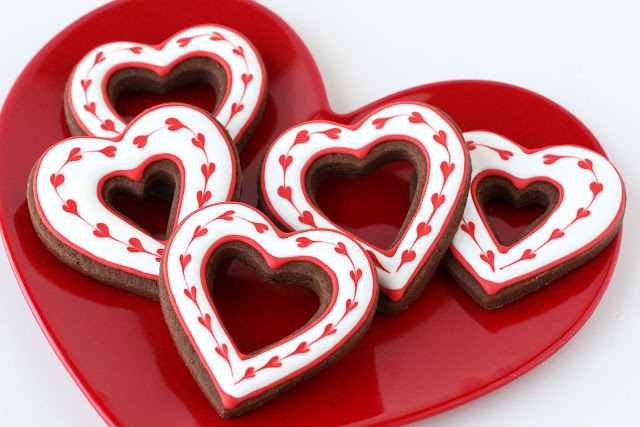 These heart Valentine’s cookies are super easy to decorate, but yield impressive results. I started with a batch of Chocolate roll-out cookie dough. I used a medium sized heart cutter to cut my shapes, then a small heart to cut out the center. 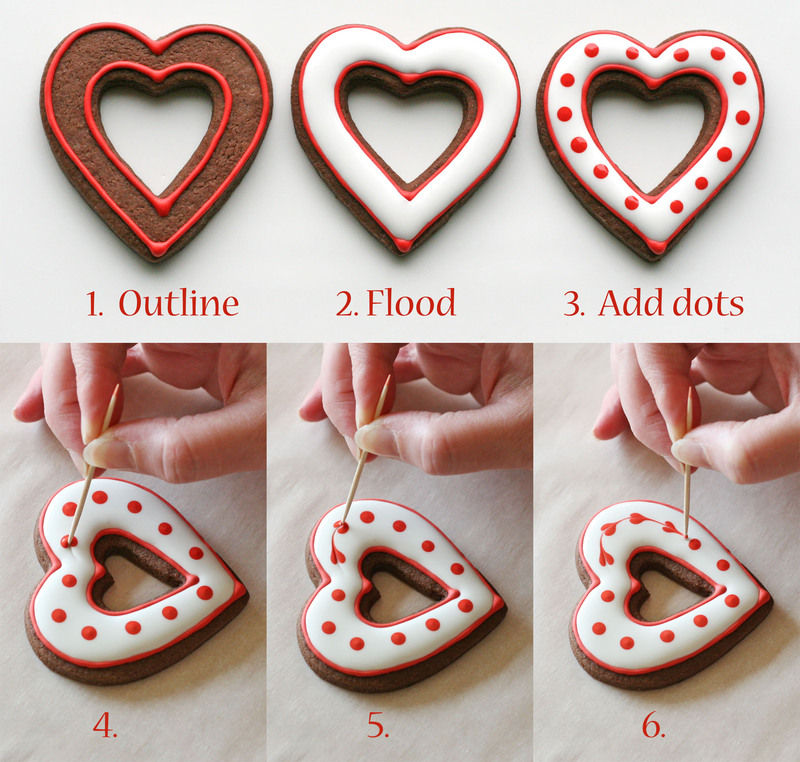 You can bake up the mini hearts, or roll the dough back together to make more hearts with cut-outs. When your cookies are baked and cooled, prepare a batch of Royal Icing. To copy this design, you’ll only need two bags of icing, one red and one white, both in a medium consistency. Certainly, adding pink details to these cookies would be beautiful as well. 1. Outline the cookies (as shown). Allow the outline to set up a bit (about 30 minutes). 2. Flood cookie with white icing. 3. Immediately, add dots (as shown). 4.-6. As soon as dots have settled into the white icing (about 30 seconds), drag a toothpick from the top center of the heart cookie, through the first dot. Continue dragging the toothpick through all of the dots on one half of the cookie, in one continuous motion (as seen above). 7. Repeat on the other side of the cookie, starting at the top, drag a toothpick through the dots. 8. Allow cookies to dry (about 8 hours). This looks beatiful. Would love for you to share your gorgeous pictures with us at foodepix.com. These are so beautiful! I love it! Those are so so cute!! The dark cookie is so pretty with the white and red! These made my eyes POP!!! This is THE prettiest Valentine cookie I've seen yet!! Love them. 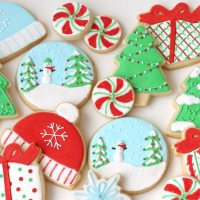 I am too scared of royal icing to make these, but oh my are they GORGEOUS!!! Your treats are so beautiful and I especially love how you photograph them all! Oh you're killin' me!!! I can't decide between these, the chocolate chip roll out cookies, or the chocolate cookie/cherry icing sandwich cookies!!! I want to do them all, but don't have time!! you are very talented. Thanks for the inspiration. I tried Royal frosting for the first time last week. It was tricky at first, but I got the hang of it. I found your site while perusing ideas on pinterest – and I LOVE your work and the tutorials – it has really helped!Do you ever add butter flavor (or any other, for that matter) to the frosting? Beautiful!! And not hard to do, Love that! Very, very nice! Simply but have a great effect! Very good idea, lovely recipes. Nice design. Very cute- love the tutorial! I'm going to attempt them so could you please tell me what size piping tip you use for the red outlines? @Tip size- I used a #1.5 PME brand tip to outline, but you could use a #2 as well. Simply PERFECTION in every way! Kwik-Snow is a fun and exciting product that makes artificial snow in seconds. Kwik-Snow will provide hours, days and even weeks of fun for both kids and adults. Now you can have instant snow anywhere on demand even where it never snows, Kwik-Snowc an make artificial or fake snow decoration even in the middle of the desert. Imagine being the envy of all your neighbours. Beautiful and so easy!! i don’t know why but I never though about making an outline first…. OH MY! This are the cutest cookies I’ve ever seen! Beautiful! Thank you for sharing it! I will try make some on my own! Thank you! 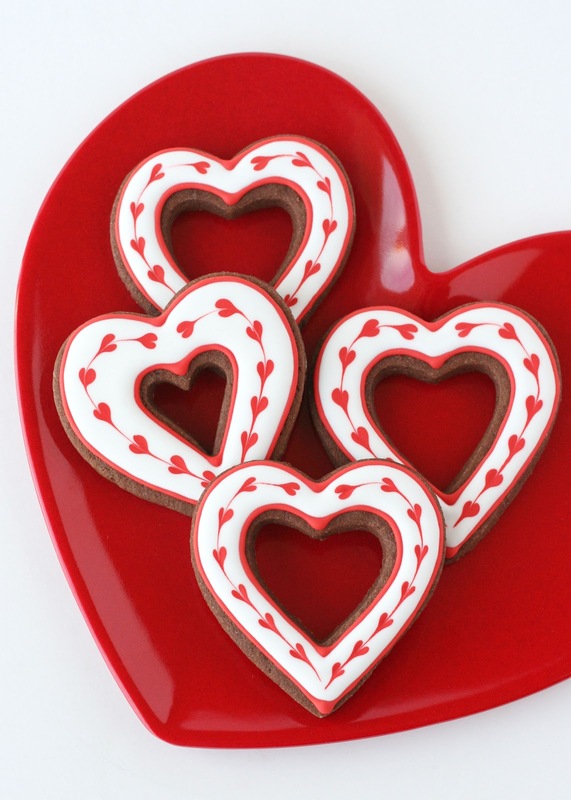 Pingback: Valentine's Day Cookies-I Mustache You for a Kiss! too bad i did not find it earlier, as i wont find sich heart shaped plate in time, but this is simply breath taking..